It's finally time to return to Hinson Lake for another 24 hours of running around and around and around the Lake. Last years race was a big success with RD Tom Gabell and his volunteers doing a great job. The weather also cooperated with near perfect conditions for late September. Last year was a special event for me. On one hand, I was having a great time running with such a great group of people. 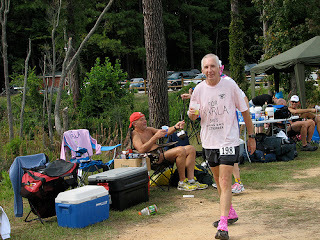 On the other hand, I was running with thoughts of my training partner Karla as she was fighting her battle with cancer. I ran in her honor and raised money in her name for cancer research. Many of the participants as well as other friends and family made generous donations to the cause. I was promised some bonuses for exceeding 100 miles and I had my own goal to run over 100. During the night my pace had slowed and I was not going to make it if I didn't speed up. Somehow with prayer and thoughts of Karla and all my supporters, I was able to find the strength and actually picked up the pace the last several hours and finished with 103.3 miles. You can check out my report and photos from last year here. I look forward to this years race, confident in my training and I hope to improve over last years distance. It will be great if Karla can come run some more this year, especially now that she is cancer-free and not have that worry on my mind. Last year an amzing 14 runners went over a hundred miles and this years race looks to be even more competitive than last years. If possible , come out and join in the fun. I'm sure Tom would welcome some volunteers, especially in the deepest hours of night. And if you can't help come run a few laps with me. That sroty really moves me, my gradmothers, aunts, and myself have all had cancer and it is one of the scariest things to go through. Fitness played a big part in my recovery, thanks for the support its people like you that give us a reason to fight.